Last week we received and email from one of our Virtual Advisory Board members, Prashant Yadav, drawing our attention to a paper just published by INSEAD and co-authored by Prashant YADAV, Orla STAPLETON and Luk N. VAN WASSENHOVE. 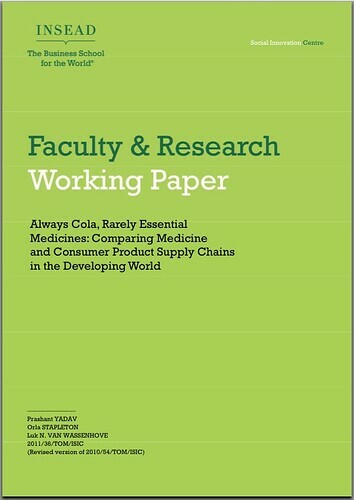 The paper is entitled: Always Cola, Rarely Essential Medicines: Comparing Medicine and Consumer Product Supply Chains in the Developing World. Interestingly, many new initiatives have begun that are attempting to replicate some of the key success factors observed in the consumer product supply chains. For instance, Village Reach is an innovative model to deliver vaccines and drugs in Mozambique that circumvents the asset specificity problem in medicine distribution through creative bundling with other products. 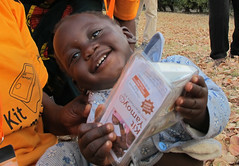 The Affordable Medicines Facility for Malaria is a pilot project to understand how points-of-sale and the breadth of the distribution channel can be expanded for anti-malaria medication (Laxminarayan and Gelband 2009) to achieve efficiencies without compromising quality or traceability. The ACT Watch project is a multi-year multi-country study funded by the Bill and Melinda Gates Foundation to use a third party to gather market data for anti-malarial medicines. The government of Tanzania has started a very successful Accredited Drug Dispensing Outlet (ADDO) program to increase the retail points of dispensing essential drugs. 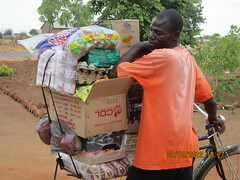 Similar initiatives are underway in Zambia and Ghana. A new project called ColaLife is trying to utilize the secondary distribution channels of Coca-Cola in developing countries to carry ‘social products’, such as oral rehydration salts to save children’s lives. We remain very excited about how the multidisciplinary nature of technical expertise being made available to the field of global health through individual commitment, private philanthropy and government receptiveness is promoting innovations that can mimic the effectiveness and efficiency of soft drink supply chains while preserving the safety and traceability that are vital to medicine supply chains.